Oct. 29, 2018 – With the average Canadian contractor 49 years old as reported last week, and no indication that median age is going down, it’s more important than ever for owners to have a succession plan to keep the company around. The issue is most prevalent in B.C. and Atlantic Canada, where two third of loggers expect to be retired in 10 years or less. In B.C. alone nearly 50 per cent (46% of Coastal contractors and 47% of Interior contractors) say they will be done in just five years or less. 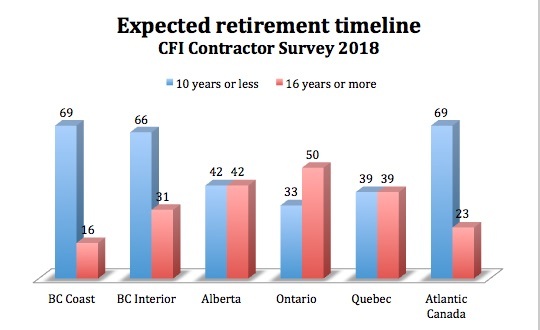 In spite of the fact Ontario is home to the largest segment of contractors 56 years or older (45%), half of respondents there plan to stay in the job for 16 plus years. Quebec and Alberta have an even split of those planning to stay for the long term and those looking to exit within the next decade. Percentage of contractors who report these expected retirement times, by region. While these retirement numbers aren’t radically different from results in our 2016 survey, what does stand out is the spike in loggers who admit to having no plan for the business to live on. Forty per cent of contractors in 2018 say they have no plan for the company after they retire. This is a 15 per cent jump from the same response in 2016. It seems fewer loggers are willing or able to have their children assume control, which dropped to 20 per cent from 27 per cent in 2016, and slightly fewer have managers interesting in taking over: 6 per cent in 2018 compared to 9 per cent in 2016. 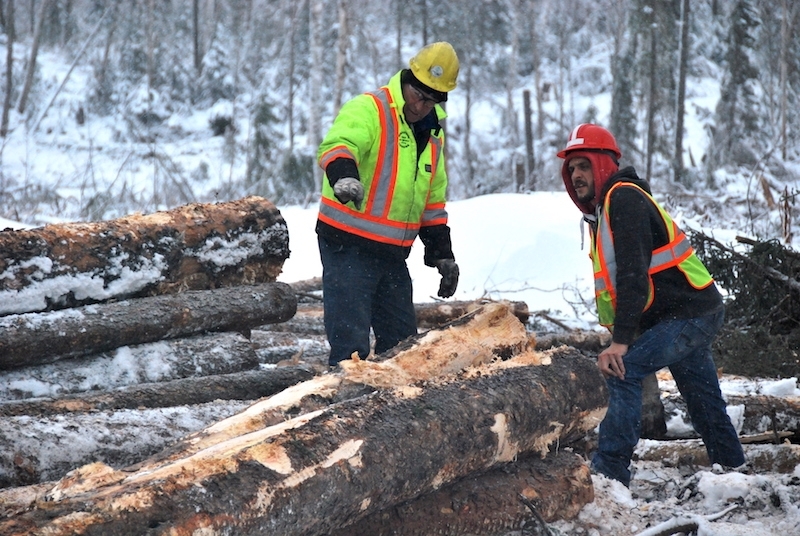 That leaves 74 per cent of loggers with no real plan for their business. Forty per cent have no succession plan, 20 per cent will auction their fleet and shut down, and another 13 per cent are optimistic about selling to another contractor. See how the numbers compare in the chart below. Percentage of contractors who plan to take these steps when they retire. Loggers in Ontario are the least likely to have a succession plan at 67 per cent, although that region also has the highest number of respondents planning to stay in the industry 16 years or more. Selling to another contractor is a popular response in Quebec (26%) and the B.C. Coast (23%), while B.C. Interior and Atlantic Canada loggers hold out the most hope for their children to take over (35% and 28% respectively). Missed last week’s survey snippet? Find a collection of reports published to date here. 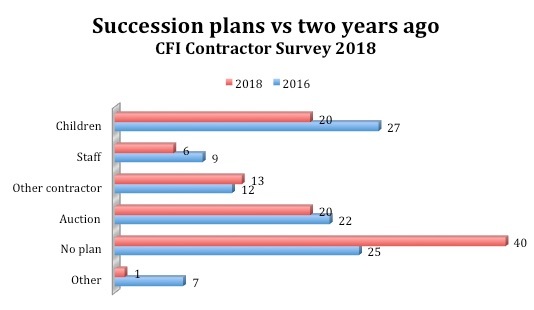 Look for more news from the CFI 2018 Contractor Survey in our enews over the coming weeks, with a final digital report in December and a summary in the November/December print issue. Be sure to subscribe to our free enews to get all the latest industry news. The survey was conducted in June 2018 by independent research firm Bramm & Associates, generating over 275 replies to a detailed list of questions. Respondents were distributed according to the geographic breakdown of the forest industry, with 40 per cent in Western Canada, 25 per cent in Quebec, and the rest found in Ontario, Atlantic Canada, and central Canada. Within B.C. responses were split between the BC coast and Interior. Many thanks to our sponsors for making the research possible – Hultdins and Tigercat.